I’ve been focused on holistic dental care for a while now, as it becomes more apparent to me all the time that our dental health has a huge influence over the health of our body as a whole. Last year, I had a mercury amalgam filling removed, which was a huge step in healing my whole body. 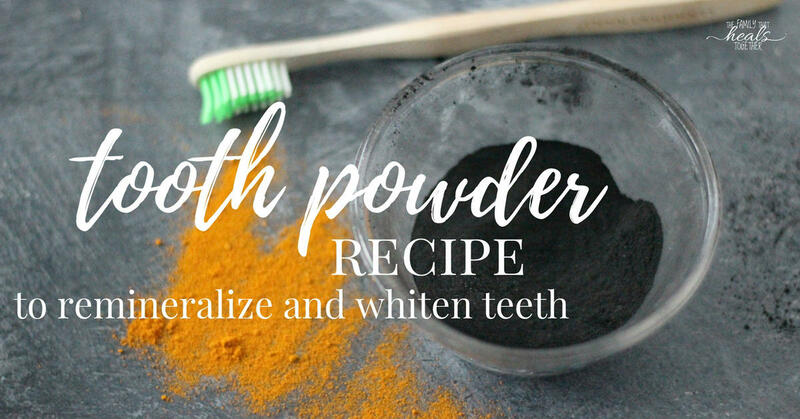 Recently, I’ve been experimenting with a tooth powder recipe to help with tooth remineralization and whitening. I’ve been obsessed with turmeric again lately. For a while, I was making turmeric capsules and taking them to fight inflammation, but it got to be kind of a hassle (as is making most things yourself). This past week I discovered how to use it to instantly relieve headaches, which you can read about soon. 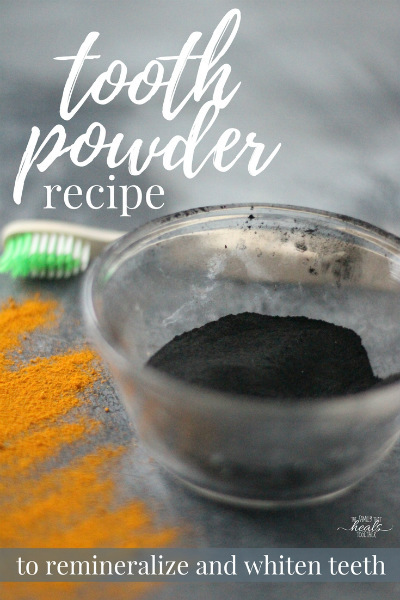 Here, I’ll share why turmeric, along with a few other key ingredients, is good for your oral health, and why I’ve included it in this tooth powder recipe. I’ve written about the health benefits of turmeric for systemic health. Turmeric has been extensively studied and found to be beneficial in relieving respiratory illnesses, including asthma, and is a powerful anti-mucosal. It is a cholagogue, which means it stimulates bile production in the liver and encourages excretion of bile via the gallbladder, which improves the body’s ability to digest fats. Not only is using turmeric an obvious power play for oral health, but turmeric helps to whiten teeth, though its ability to do so is less understood. Get organic turmeric powder here. It’s pretty well-known that activated charcoal helps to whiten teeth. Activated charcoal works like a sponge, absorbing everything it comes into contact with. It’s why it’s recommended when you have food poisoning or ingest something you aren’t supposed to. That’s also why it works so well to whiten teeth, by absorbing stains, as well as polishing teeth with its gentle scrubbing texture. It also helps to support overall oral health due to its ability to attach itself to a number of unwanted oral invaders, and carry them safely from your mouth. Charcoal can also help balance the PH of the mouth as well as prevent cavities and help teeth to remineralize. 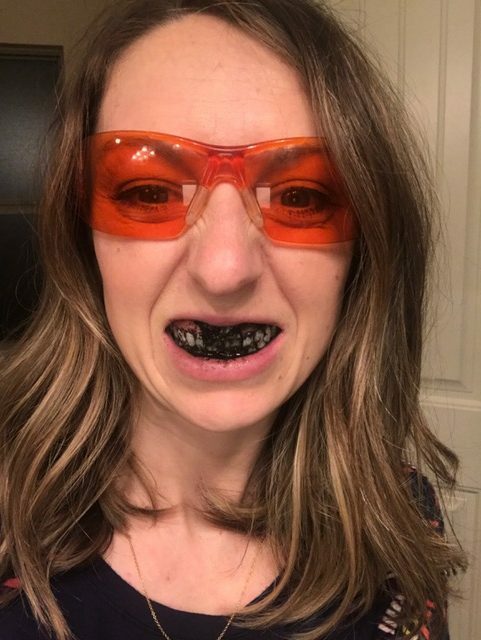 There have been concerns that activated charcoal may damage tooth enamel, and a little research leads me to believe we should be cautious but not worried. Conventional dentistry says that teeth cannot remineralized and cavities cannot be healed. A holistic perspective tells us this is not true. Cavities can be healed without drilling. So, my opinion is that, especially since this tooth powder recipe contains additional mineral-rich ingredients, we shouldn’t worry too much about wearing away our enamel. Cute picture of me using this tooth powder. You’re welcome. Harvested from naturally-occurring volcanic ash, calcium bentonite clay (the kind safe for internal use) is a mineral-rich substance helpful for a variety of health concerns. Because it is absorbent like activated charcoal, I put it in my detox baths several times a week to help draw out toxins. It’s also useful to take internally as a supplement to help absorb unwanted pathogens in the digestive tract. I put it in this tooth powder recipe for the same reason, as well as its ability to impart minerals. Bentonite clay contains high levels of trace minerals including silicon, magnesium, calcium and potassium, which make it the perfect ingredient for tooth remineralization. Get calcium bentonite clay here. We’ve talked about the benefits of Himalayan salt, and I’ve told you all about sole water. I’m a pretty big salt fan. But not just any ol’ table salt, which is devoid of nutrients and may even contain contaminants. I love using mineral-rich salts like Real Salt, pink Himalayan salt, and gray Celtic salt, all of which contain differing amounts of trace minerals. It’s why I use high-quality salt in as many ways as I can daily for my health, and it’s why adding Celtic sea salt to this tooth powder recipe is a no-brainer. Update: I later added about a tablespoon of MCT oil (also good for oral health!) to make more of a paste, as well as clove and peppermint essential oils to freshen breath and kill germs. I really love the updated version! I’m an equal opportunity employer of beneficial ingredients, so I just eyeballed them and put about the same amount of each one. A few times a week, or as often as you’d like, dip a damp toothbrush in the bowl and give your teeth a scrub for a few minutes before thoroughly rinsing. Be careful not to spill on floors or counters, because this tooth powder will stain grout. And clothes. And everything else it touches, except your teeth, which it will have the opposite effect on. Because science. Since using this tooth powder, tooth pain has eased and the gum bleeding I had at every brushing is gone. Even better is that my little sister has reported whiter teeth AND her constant tooth sensitivity is gone! This stuff works, y’all! Read more about healing cavities here. Do you have a super crunchy friend who’d love this tooth powder recipe? Be sure to share using one of our links below. Make Herbal Tinctures and Extracts: The Simple, Frugal Solution for Every Ailment! I have to ask…turmeric stains everything on contact and does not rinse off, so how can it not stain the teeth? Does the charcoal or the clay make it behave? Orawellness has a new product (2/2017) called Shine that remineralizes and whitens teeth, and, while I trust this company, it’s a pricey product. The teeth are resistant to tutoring staining power… additionally, there is an ultraviolet light reflective component to turmeric, which some say helps with the bright white appearance… ? I don’t know, but it doesn’t do anything but clean and brighten real teeth. One warning, don’t use on temporary crowns, you’ll end up with highlighter yellow teeth! Experience with my front two after an accident taught me this… I looked like a beaver! Thank you so much for sharing this. I am ordering ingredients today and getting started as soon as possible. I received an estimated bill of $1400 for 5 small cavities!! It is time to stop the maddening cycle of cavities, fillings, lots of money, cavities, fillings, lots of money. I hope it helps Tabitha! Could I use Real Salt instead of the Celtic salt? I have Real Salt right now, and I’d love to make this and start using it. My teeth keep getting more and more sensitive, partially due to GERD. I add probiotic powders to mine, too. As well as a daily oral / dental probiotic. The dentist/periodontist couldn’t explain the results. But then, neither were into holistic ‘the body is intelligent!’ methods. What is the correct amount for the salt? In the recipe it reads 1 tsbp… I wasn’t sure if it was meant to be tsp or tbsp? Thank you. I’ve wanted to try charcoal for a while but I’m afraid it will get into hairline cracks in my tooth enamel. Have you ever had it fail to wash away completely after brushing?